Little House in the Big Woods by Laura Ingalls Wilder. Scholastic, 1932. Currently available. Face Value: I have a special place in my heart for the illustrations of Garth Williams. His drawings graced the pages of some books that are very memorable to me, and there is something about the way he brings the characters to life that fits with my vision of what the Ingalls family should look like. Any other cover feels wrong, so it is especially disappointing when I see covers in the store with stills from the television series as the featured image. I think that Garth Williams’s illustrations are timeless, and it is a shame to abandon them in favor of images from a TV show that only loosely followed the details of the series. Does it break the slate? Laura is not yet a Slatebreaking character in this book, but the glimpses of her desire to challenge gender norms are sprinkled throughout her recollections. This is the first book in the Little House series, and Laura will eventually grow into a bright and independent young woman. And although Ma and Pa’s marriage exhibits a very traditional division of duties, Wilder writes about their relationship in a way that shows how they supported each other as equals and valued each other’s skills and talents. Who would we give it to? Little House in the Big Woods can be a magical reading experience for little girls living in the Midwest who wonder what life was like for those who first settled the land. As a Wisconsin resident, I loved reading the book and then driving to Pepin with my family to see how much the town had changed since Laura lived there. Book Review: For me, Little House in the Big Woods is the literary equivalent of comfort food. Reading this book is like sitting down with a big bowl of delicious macaroni and cheese. My parents read all of the books in the Little House series aloud to me when I was a kid. We continued reading together as a family far past the time when I could read independently, and these stories were a bedtime ritual for many years. I was fascinated by the hard work, isolation, and do-it-yourself nature of the Ingalls family lifestyle. Laura’s life was so different from mine, yet I felt connected to her in some way. We were both little girls living in Wisconsin and trying to figure out how we fit into our families and the world around us. Given my history with this book and emotional attachment to the story, it is difficult to review it with an open mind as an adult. I cannot help but feel catapulted back to my childhood bedroom, with my parents’ voices reading the words aloud as I drift off to sleep. Reading it now, just a month after I have moved back to Wisconsin, also has special meaning. It’s as if I am trying to make peace with my relocation through my reading material. The rituals of Laura’s frontier childhood soothed me through this time of transition. Little House in the Big Woods is not really about plot. The book is a chronicle of a year of pioneer life in the heavily wooded northwest area of Wisconsin. We get to know Laura and her little family of Ma, Pa, sister Mary, and baby Carrie as they work through the seasons. I love the chronological and rambling nature of this book, which is unusual. Normally a book written in this style would drive me bonkers with its lack of plot direction, but I find it endearing in this novel. Ingalls Wilder describes in detail the domestic tasks that she and her parents went through every year to feed, clothe, and entertain themselves. The descriptions of tinting the butter yellow, making maple candy, and smoking meat are as familiar and wonderful as if I had done these things myself. In fact, reading this book made me want to dig in deep in my kitchen and do something outrageous like churn butter or make salt pork. This instinct was no different as a child – I made many a ridiculous request of my mother, asking her if we could ever try to turn my lips red like lipstick by rubbing them with a piece of flannel, as Laura’s mother and aunts do in the book. As a sister, I appreciated reading Laura and Mary’s relationship and understanding that I was not a bad person for sometimes getting upset with my sibling. Laura’s relationship with her father is heartwarming, and his stories earn a special place in the text. The atmosphere of the Ingalls household is vivid thanks to Ingalls Wilder’s descriptions. The tastes, smells, textures, and sights of living in the big woods are accessible to readers at any age. I did have one shock as I was re-reading the novel. Laura writes about her father’s fiddle playing and often included the lyrics to her favorite songs. One of the songs had very racist, very outdated lyrics. I was stunned upon reading these words because I don’t remember anything like that from my childhood. I wonder if my parents chose to omit that portion while reading the book aloud to me. 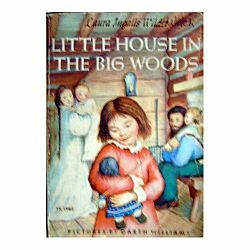 In the other books in the Little House series, Laura’s attitude towards other cultures becomes more troublesome, but I thought that this book was free from the racist overtones because the family was so isolated in the woods and lived alone. Nope. I guess not. Discerning parents and teachers may choose to have some thoughtful discussions with young readers about the outdated notions about other ethnicities that can be found in the Little House books. For me, Little House in the Big Woods absolutely stood the test of time. It felt so good to re-read this book. I think that young readers of today can find just as much joy in these texts, and perhaps even more as our techno-focused culture distances itself from the self-sustaining lifestyle that was required of settlers. I firmly believe that Laura, the quintessential frontier girl, will continue to enchant readers for decades. Reviewed from a copy I have had since childhood. This entry was posted in Middle Grade, Reviews, Theme Week and tagged cabin, Frontier Week, Homesteads, Laura Ingalls Wilder, Little House series, Pepin, pioneers, Wisconsin. Bookmark the permalink.